Today I gave a slide talk on Morton D. "Buster" May's home designed by Chicago architect Samuel Marx. It was constructed in 1941-42 and constituted an early, excellent example of International Style architecture in the Saint Louis suburbs. Morton D. "Buster" May's House at 2222 South Warson Road, Ladue, Missouri (1941-42). Photograph by Hedrich-Blessing. - The special challenges of historic preservation of modernist architecture including land speculation, preservation ordinances and property boundary modifications. Paul Hohmann photograph of interior (July 2005). 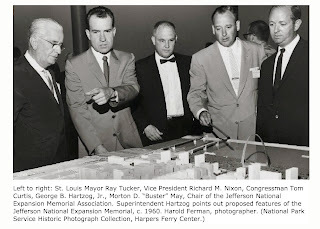 - The important contributions of Morton May to Saint Louis including his extensive art collections largely held by the Saint Louis Art Museum, his dedication to seeing the Jefferson National Expansion Memorial project from the city's riverfront implemented and his contributions to the business community by making the May Company one of the most progressive department stores in the country. 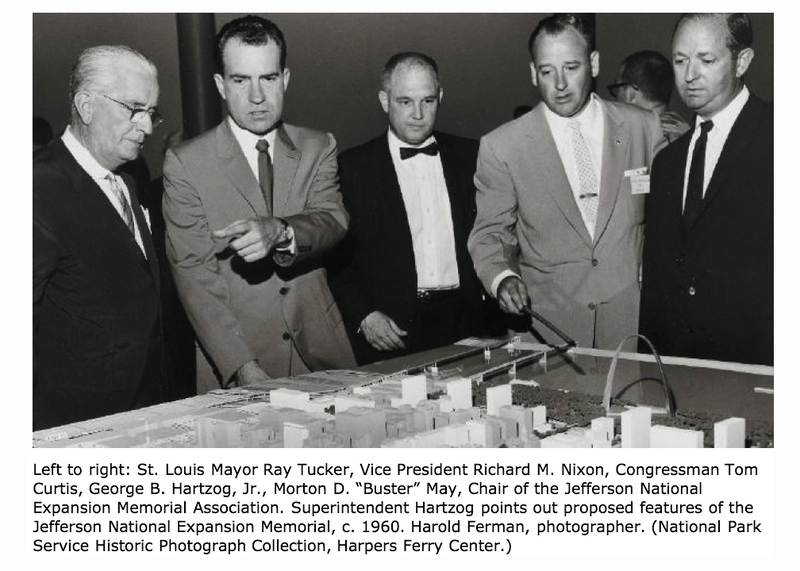 Photograph including Mayor Tucker (far left), Vice President Nixon and Morton May (far right). May was chair of the Jefferson National Expansion Memorial Committee. 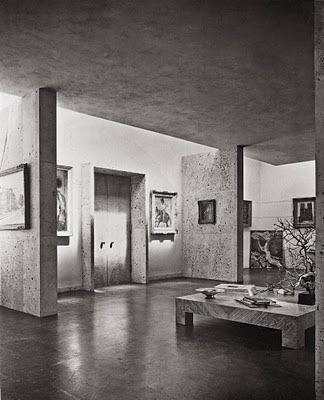 - Overview of Samuel Marx's architectural career, furniture designs and art collections including his restaurant and hotel interiors, museums and galleries as well as residences. Marx's careful integration of architecture and interiors received special emphasis. Glass coffee table with book display shelves below designed by Samuel Marx. I was asked to show some video clips that were taken by Saint Louis architect Paul Hohmann before the house's demolition. Here's a link to the first of two videos he posted to YouTube. Below is a photograph from the same time. Photograph by Paul Hohmann posted to Flickr documenting the house prior to its demolition (July 2005). Compare the above photograph taken by Hedrich-Blessing of the house in 1942 with this image of the house before it was demolished. The house was fundamentally unchanged. It had simply been a victim of a combination of lack of maintenance and real estate speculation. An ad by Admiral from 1942 featured the futuristic moderne styled "radio" as proposed by Marx. The image at the bottom left shows the unit when closed and not in use, while the central image offers a vision of a multimedia future with radio, television and turntable all in one unit. 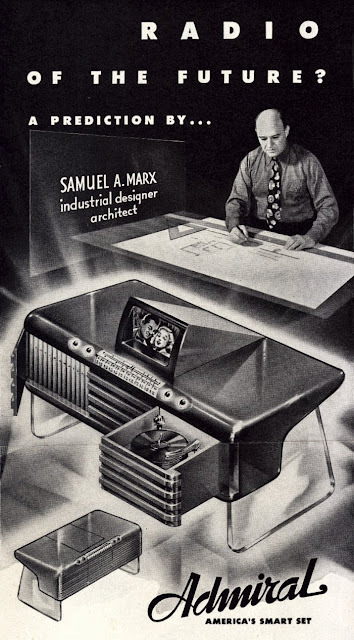 Advertisement for a "Radio of the Future" designed by Samuel Marx. The streamlined design with emphatic horizontals, rounded edges and clear lucite supports must have seemed an unreal vision to many Americans in those difficult days of World War II. As far as I know, the design never went beyond this concept drawing. It's interesting that Marx is depicted hard at work at a drafting table with two titles: "Industrial Designer" and "Architect". The position of the designer in society was still in flux at the time and the concept of an industrial designer still relatively new. What sort of background should an industrial designer have? 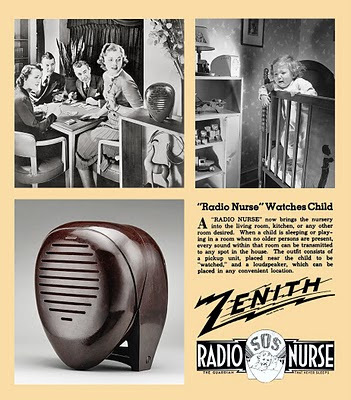 Zenith's Bakelight "Radio Nurse" of 1937 designed by Isamu Noguchi must have set a precedent that Admiral would have liked to follow. 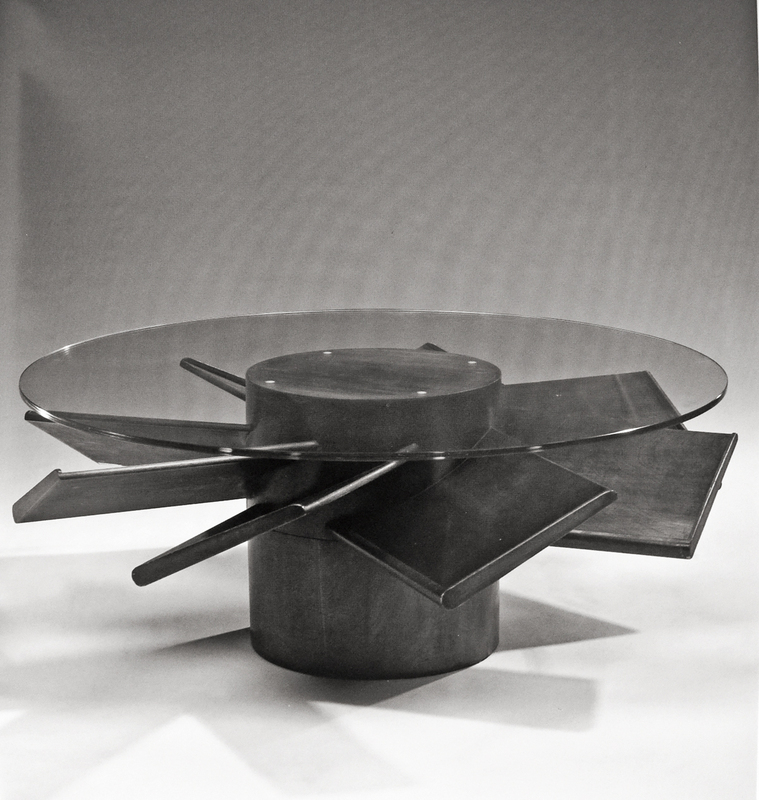 Noguchi's design was exhibited at the Museum of Modern Art in the "design" category, but such work would not be viewed as being considered in a category on a level with "art" for many years to come. Images from advertisements and publications of Noguchi's Radio Nurse of 1937. Even Samuel Marx the painter and artist likely wouldn't have considered his design work on a par with art. Should he have thought about his design work differently? 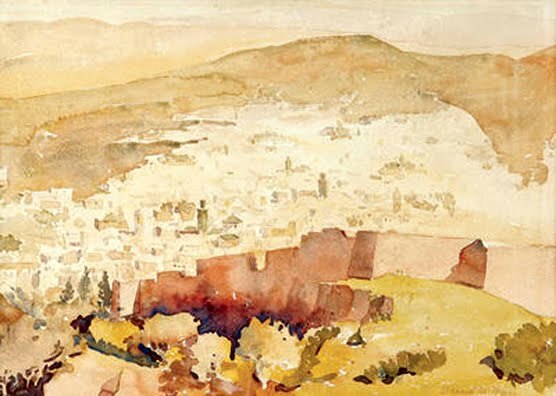 Watercolor by Samuel Marx from Morocco. I'll be giving a talk on the Morton May House in Saint Louis designed by Samuel Marx this Sunday 26 September 2010 at 3pm. The slide talk will be held at Landmarks Association of Saint Louis. My talk is part of a series on mid-century modern architecture being held this fall. Reservations are required as the talks are quite popular and only 50 people can be accommodated. 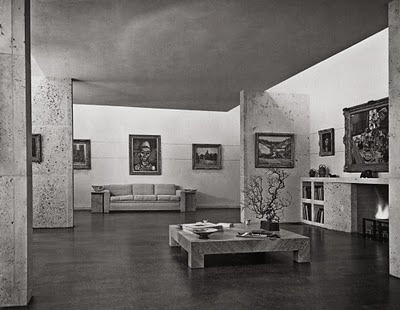 As an art collector and director at the Art Institute of Chicago, Samuel Marx was constantly in contact with galleries, dealers and collectors of 20th Century modern art. 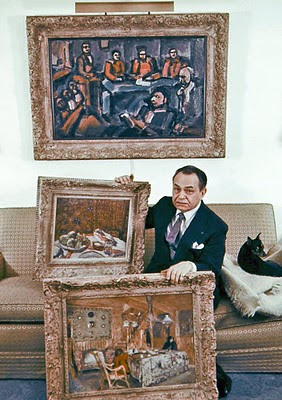 One of the most extensive collections Marx worked with belonged to Edward G. Robinson who was an obsessive collector. 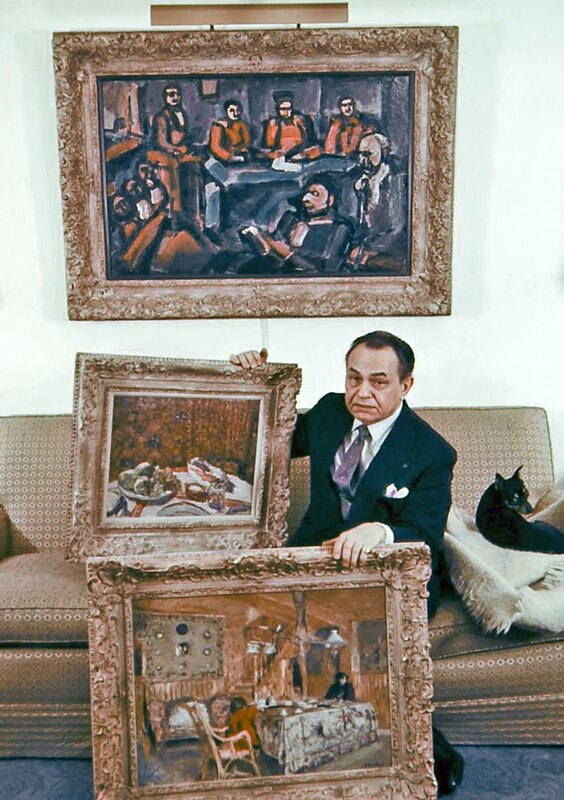 Edward G. Robinson with some of his prized art works. Photograph from LIFE magazine online digital archive. 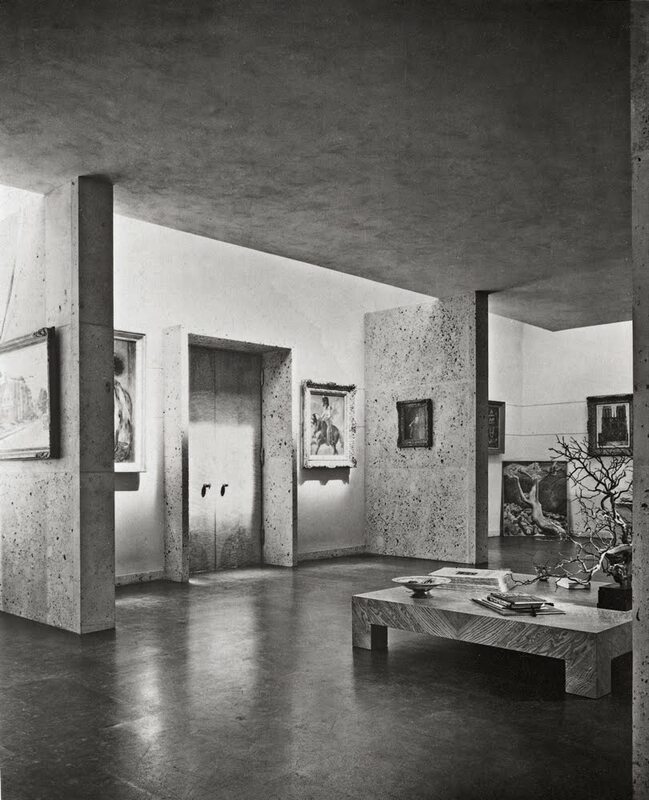 In 1941 Robinson commissioned Marx to design an art gallery attached to his home at 910 North Rexford Drive in Beverly Hills. Robinson's home was a picturesque Tudor style and the actor contemplated selling it after building a new home that would better accommodate his growing art collection. Marx convinced Robinson to stay in the house which was then remodeled to display his collection to its greatest effect. Ultimately, they decided to construct a new free-standing windowless art gallery. While the exterior was plain with a peaked roof, the gallery's interior was modern to the core. 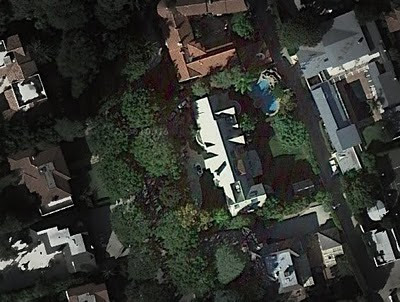 New art gallery at the south end of the house has skylights set into its peaked roof. Courtesy of Google Maps. The gallery addition replaced an existing badminton court at the south end of the house. 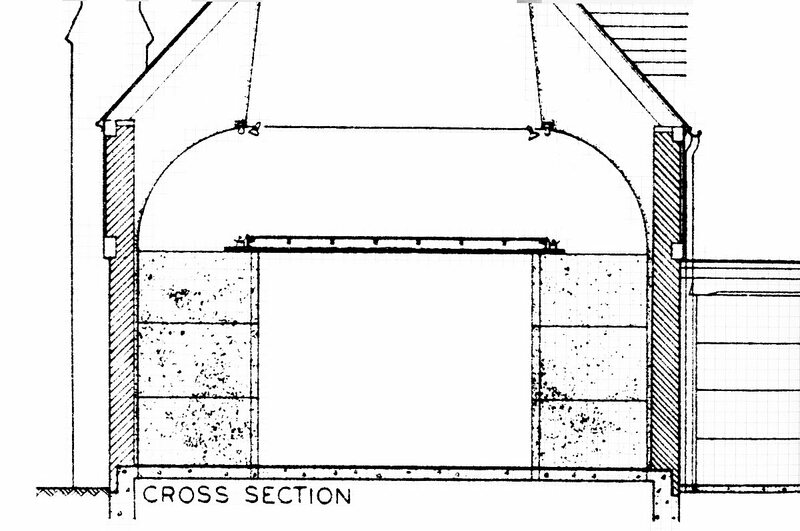 A porte-cochere was constructed linking to the existing structure. 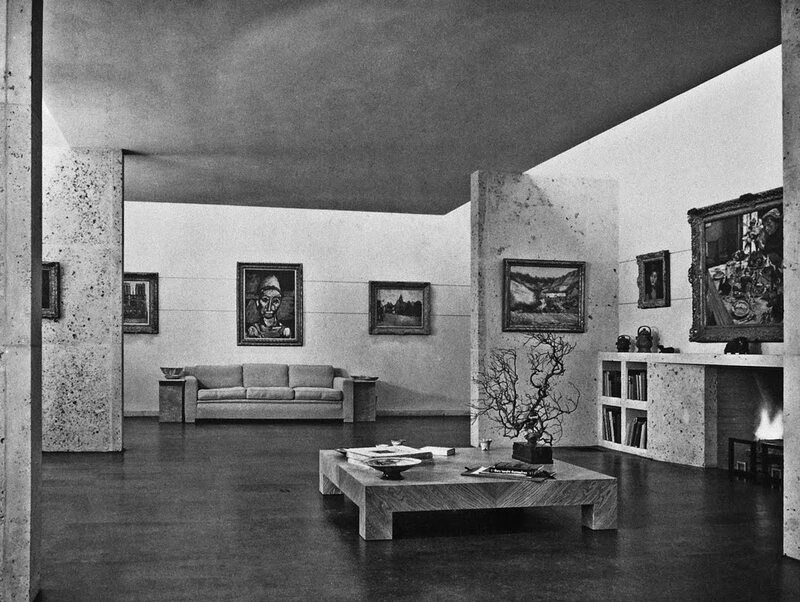 Samuel Marx's clean modern design for the interior of Edward G. Robinson's art gallery. While the above black and white image represents the fundamental architecture of the gallery, the color photograph published in an issue of LIFE magazine provides a richer sense of the character and palette of the space. For Marx, architecture and interiors formed an interconnected whole. He would typically refuse projects for which the client requested his architectural design services only. He believed the interior fixtures and finishes were an essential aspect of a project's experience and integrity. 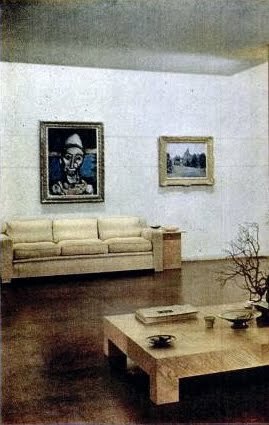 Color photograph of Robinson's art gallery published in the March 1, 1948 issue of LIFE magazine (page 66). Marx employed fossil-encrusted stone (a favorite material) as the primary structure organizing the space. 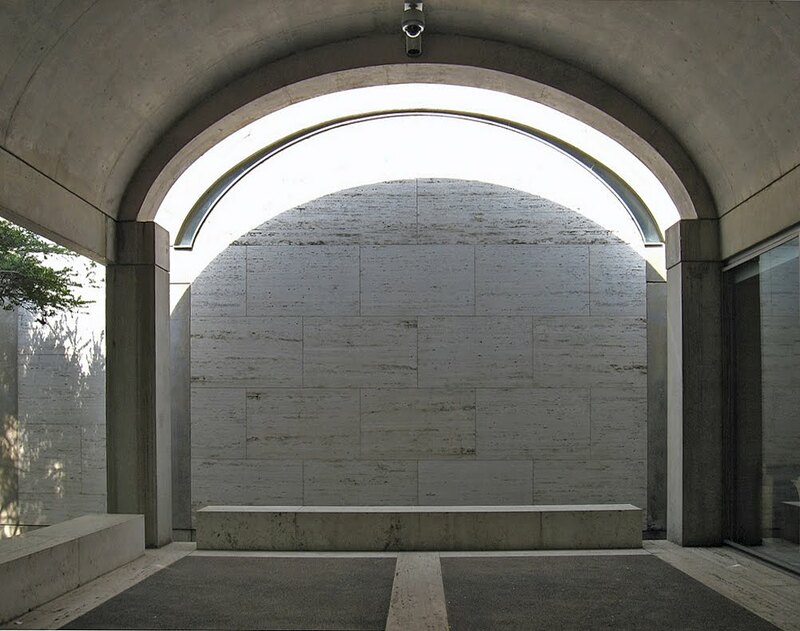 Sets of stone slabs support a floating ceiling plane above and allow filtered natural light to wash the gallery walls. Marx's cross-section through the new art gallery. Image from Ultramodern: Samuel Marx by Liz O'Brien. 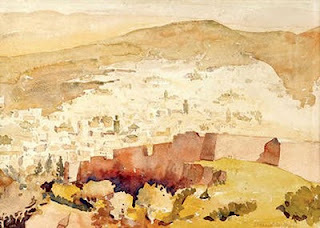 Marx had a keen understanding of the requirements for displaying art from aesthetic, practical and technical viewpoints. The skylight prevented any direct harmful rays of the southern California sky from reaching the works. A scrim was installed above the floating plane diffusing the light further while directing it toward the gallery's outside walls. Use of fossil stone is consistent and considered: surrounding entry, fireplace and free standing partitions. 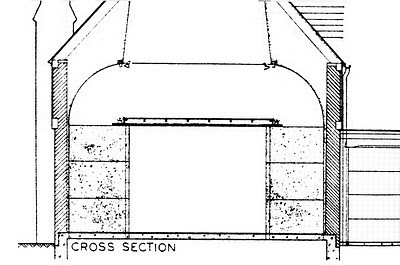 Marx also provided an ingenious artificial lighting configuration approximating the daylight configuration in intensity and orientation, while keeping the fixtures concealed from view. 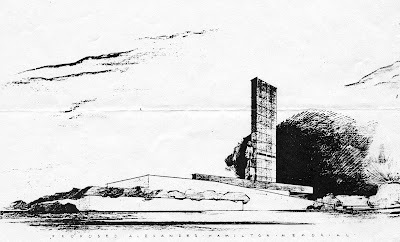 In some ways the design suggests Louis I. Kahn's later design for Fort Worth's Kimball Art Museum . Louis I. Kahn's Kimball Art Museum, Fort Worth, Texas at captured in a photograph posted on Flickr by tim_buk2. Photograph by Hedrich Blessing from the Archives of the Art Institute of Chicago. Samuel Marx designed the Alexander Hamilton Memorial in Chicago's Lincoln Park in 1953 as a set of abstract stone slabs juxtaposed with a statue of Hamilton supported on a cantilevered block of red granite. The origins of the commission could be found decades earlier with a bequest to the Art Institute of Chicago to erect a monument in his honor. Photograph by Hedrich Blessing from the Digital Archives of the School of the Art Institute of Chicago. 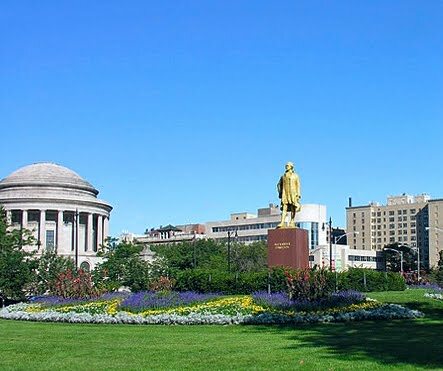 In the 1930s, philanthropist and art patron Kate Sturges Buckingham (1858 – 1937) decided Chicago deserved a monument to the country's first Secretary of the Treasury, Alexander Hamilton (1757 – 1804). She considered Hamilton to be “one of the least appreciated great Americans.” She believed he was responsible for the nation's financial prosperity and made her family's fortune in banking and grain elevators possible. 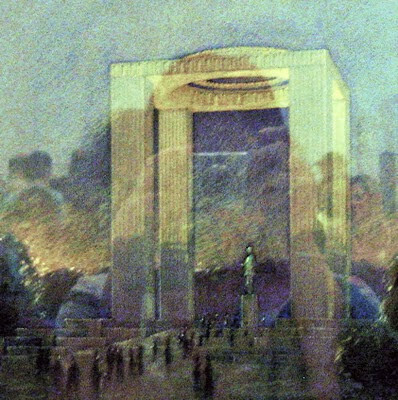 Photograph of original rendering by Eliel Saarinen at the Art Institute of Chicago by Flickr member chernobyl.skies. Eliel Saarinen design proposed creating a monumental framework 80 feet tall to surround the bronze statue created by the New York figurative sculptor John Angel toward fulfilling Kate Sturges Buckingham's conception. The collosal stripped classical exedra wasn't favorably received by the public and the project remained incomplete upon her death in 1937 without a site or setting firmly established. Died. Kate Sturges Buckingham, 79, Chicago art patron, philanthropist; of heart disease; in Chicago. Of Miss Buckingham's numerous gifts to Chicago, most spectacular was $1,000,000 she gave in 1927 for the Clarence Buckingham Memorial Fountain in Grant Park, which she endowed for $300,000. The Art Institute of Chicago was entrusted with carrying out her wishes in the erection of the Hamilton Memorial. Over time, questions were raised regarding the project and whether the funding would revert to the Institute if a memorial was never constructed. 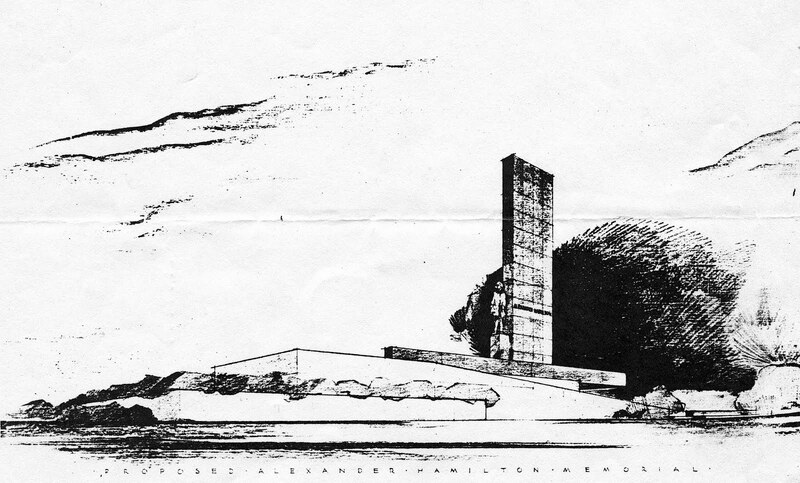 Samuel Abraham Marx's design for the Alexander Hamilton Memorial. The Institute directed architect Samuel Marx to design a more appropriate setting for the Hamilton statue. 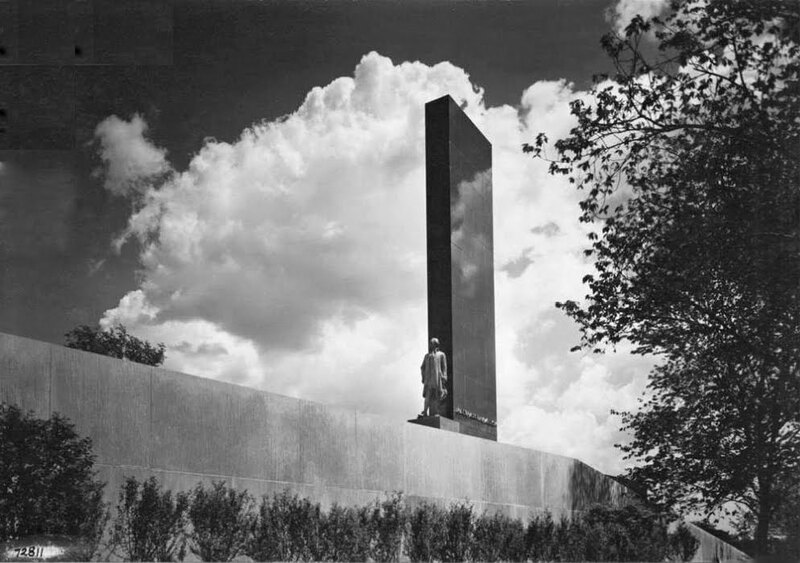 While the overall height of the structure (78 feet) was of a similar scale to Saarinen's design, the overall visual mass was reduced considerably emphasizing the free-standing sculpture which it was decided should be gilded. The site was to be in Lincoln Park. Postcard of Lincoln Park, Alexander Hamilton Monument from the SAIC Digital Archives of the Art Institute of Chicago. 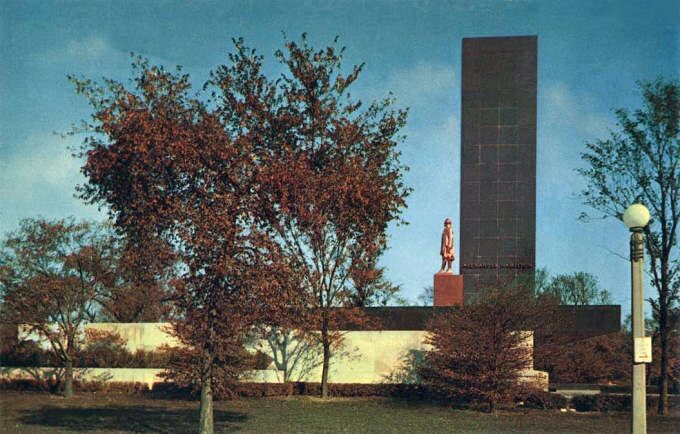 Unfortunately the structural basis for the stone clad monument was eventually found to be inadequate and in 1993 the modernist setting for Hamilton's statue was removed leaving only the red granite base set in a landscaped garden near ground level. Photograph of Alexander Hamilton Memorial by Flickr member evanembee. Thus, through a series of indirect decisions and circumstances, we find Alexander Hamilton in bright gold standing atop a block of red granite. While it certainly isn't quite as grandiose at Kate Sturges Buckingham originally envisioned, perhaps it retains some of the dignity she desired. What do you think? Would Saarinen's more classical design been more appropriate and lasting? Or do you think Marx's modernist composition should have been retained and rebuilt? 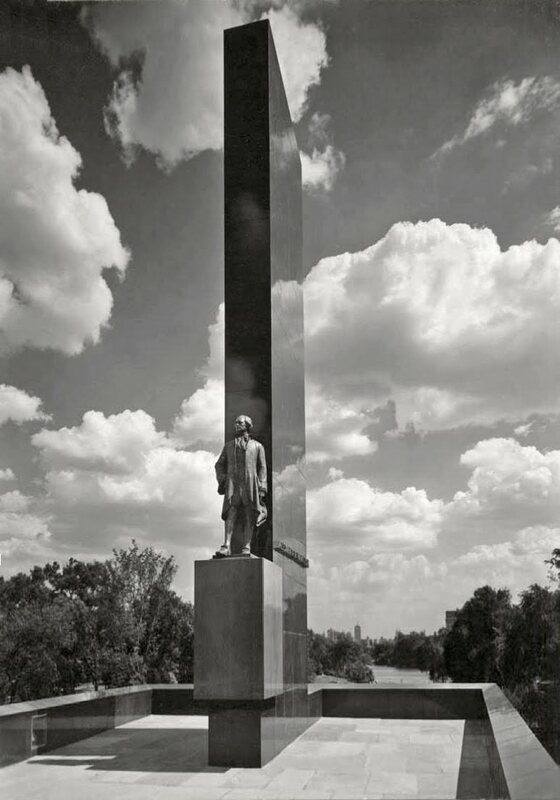 Or do you like the monument as it exists today? Lines of Beauty Exhibit at Landmarks Association ! View of south elevation of the home with views looking out over its pastoral landscape. Photograph by Hedrich-Blessing courtesy of the Chicago Historical Society. 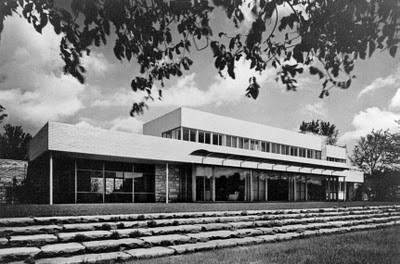 One of the best International Style houses built in Saint Louis was undoubtedly this home for Morton D. May by the Chicago architect Samuel Marx. Located at 2222 South Warson Road in Ladue, the house was built in 1941. At the time, Morton "Buster" May was an executive of the May Company and heir to the May family fortune. 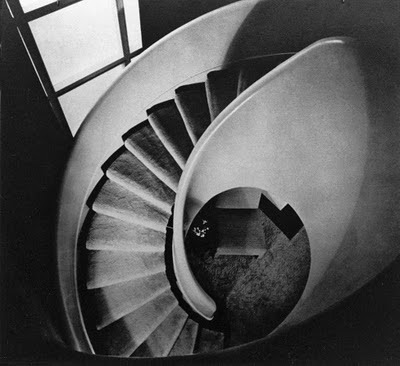 View looking down on the dramatic helical staircase at the center of the home. Photograph by Hedrich-Blessing courtesy of the Chicago Historical Society. 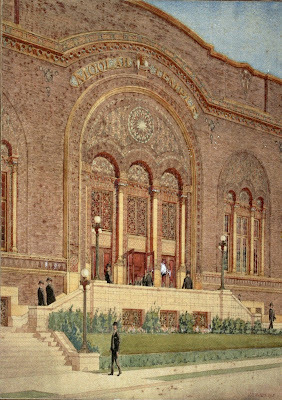 A series of blog posts will provide an informative introduction to the circumstances surrounding the house's design and construction, related works by the architect (including commissions for May Company Department stores), Marx's influence on May as an art collector and the home's significance in Saint Louis architectural history. 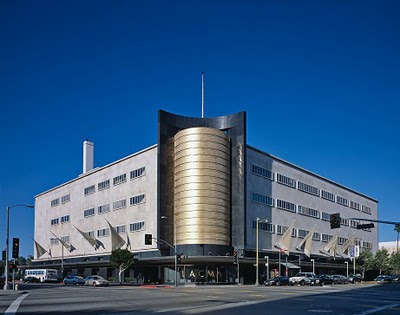 Photograph of the Los Angeles May Company Department Store on Wilshire Boulevard by Carol Highsmith via Library of Congress Pageturner. These posts will serve as a prelude to my upcoming talk at Landmarks Association of Saint Louis on Sunday 26 September 2010 at 3pm. You must make reservations to attend the event. My talk is one of a series of talks on Sunday this fall focused on Saint Louis modernism.